As some readers of Australian Musician will know, carrying a guitar around in public is similar to having a dog. Complete strangers will approach you, with the total assumption that you are dying to discuss the size/age/breed/brand and character of your animal, and are similarly eager to hear all about theirs. If you can relate to this analogy, then you can imagine that carrying a ukulele around in public is like having a puppy. You will instantly become the most popular attraction in your tram/pub/elevator, inspiring delight and curiosity in punters of all ages. It is a well known fact that people love everything miniature. 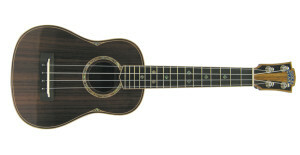 The ukulele is not only small (and therefore great), it is also mildly exotic and sounds funny to say. It makes people smile just to have the word ukulele pop out of their mouths. My dear friend Maylise and I have been wafting around in a faux Hawaiian outfit called The Ukeladies for a few years now, and to our great joy we have just acquired two of our namesakes, the Cole Clark Ukelady, model 3. These little beauties are a relatively new product in the Cole Clark quiver of instruments, and are described as a superior quality Australian made ukulele. All three models can be purchased with or without pickups. 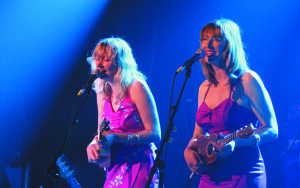 Although the ukulele is essentially an acoustic instrument, it is awesomely helpful to amplify them when playing live. The Ukelady has two pickups, bridge and face. It has a basic tone and volume control, and the option of selecting either of the pickups or using a blend. It also has a built in rechargeable preamp that comes with a charger, just like a mobile phone. An hour of charging will give you roughly eight hours of playing time, (which seems perfectly adequate for our epic half hour set.) The pickups and preamp have been elegantly installed, and don’t interfere with the line, weight or tone of this delicate instrument, and they sound just as lovely un-plugged. The design is traditional and very appealing, using quality Blackwood, Rock maple, and Indian Rosewood timbers. The model 3 has gorgeous abalone waist sound hole and fret board inlays. May’s nut brown Blackwood model not only matches her hair, but has a warm tone that suits her voice, and 1950s Hollywood bombshell style. My Queensland Bunya model is suitably blonde, and has a brighter tone that compliments my chipmunk voice and 1970s Gold Coast hair. The most wonderful thing about a ukulele, is its size and weight make it perfect for entertaining friends at barbecues, or around the kitchen table. They are also handy for hammocks, long car trips, beach holidays, picnics, and bursting out of giant cakes (if you are in the biz). If someone will dink you, it’s quite possible to play the uke perched on the handle bars of a bicycle. If you are riding solo, they fit in most baskets and back packs, enabling you to travel to gigs in a pleasant and environmentally friendly fashion. They partially fit into most of the larger varieties of modern handbag, and if you also purchase a case for your ukulele, it can double as your handbag. Most cases have enough room for a small purse, phone, keys, lipgloss and a tube of sunscreen (day) or bronzer (evening). They are easy to play and a simple but effective accompaniment to singing. I sincerely recommend these instruments to all lovers of music and good times in general. Summer is almost here…..